Biography & Genealogy: Benjamin Elliott, Class of 1851: Genalogy: Born- August 8, 1830, in Frederick, Warren Co., Va. Father- John Murray Elliot; Mother- Lucy Helen Bryarly. Pat. Grandfather- Benjamin Elliot; Mat. Grandfather- Samuel Bryarly. Grandmothers- unknown. Married- Susan Gibbs; one child- Benjamin Elliot. Matriculated to VMI from Madison Mills, VA. At VMI 3 years. Pre War Career: moved to California after graduating from VMI and subsequently settled in Bates, Missouri. 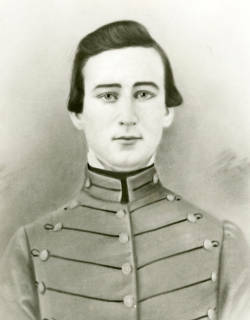 Military Record: Lieutenant in "Boyce's Company" in Kansas border wars during the 1850s; at Lexington, Missouri in June 1861 where he helped organize and served as a Drillmaster for Lafayette Company (Missouri) that became part of 2d Regiment, 8th Division, Missouri State Guard; at Wilson's Creek (Oak Hill) Aug. 10, 1861 after being assigned to command the Regiment; elected Colonel on Sep. 9, 1861 when the regiment was reorganized; regiment disbanded at the end of 6 months and he resigned his commission on Dec. 11, 1861; enlisted for 1 year on March 2, 1862 at Cove Creek, Arkansas initially as a Private, Company C, 3d Missouri Battalion; later served with the 6th Missouri; severely Wounded in Action (face) on Mar. 7, 1862 at Pea Ridge (Elkhorn Tavern); rejoined unit but discharged on June 5, 1862 due to disability; Re-entered service on an unknown date (possibly Sep. 10, 1862) as a Captain with Company I, 5th Missouri Cavalry (1st Missouri Cavalry; Colonel B.F. Gordon's Regiment of Missouri Cavalry; Colonel J.O. Shelby's Regiment of Missouri Cavalry); Company called "Captain Elliott's Company, Guides, and Spies;" transferred (most likely on Dec. 1, 1862) to, and commissioned (date of rank Nov. 26, 1862) as a Major of the 9th Missouri Cavalry (10th Battalion of Missouri Cavalry; 1st Missouri Cavalry; Elliott's Regiment of Missouri Cavalry); severely injured on Dec. 7, 1862 at Prairie Grove when his horse fell as he was "leading headlong a charge, five lengths ahead of his best and bravest [men];" promoted to Colonel late summer or early fall; highly praised for service in several engagements; commanded Shelby's Brigade during October, 1864 at Westport; lived in Mexico for 11 years after war, but then returned to Missouri. Post War Career: merchant, farmer, law enforcement. Died- Aug. 13, 1911 in Odessa, Missouri.